Le Pantruche is a darling bistro in Paris, complete with the chalkboard menus, copper footrests, and domed lamps with some Art Deco. One of the chefs has a French twist on the classic chocolate chip cookie. They are petite and oh so good! 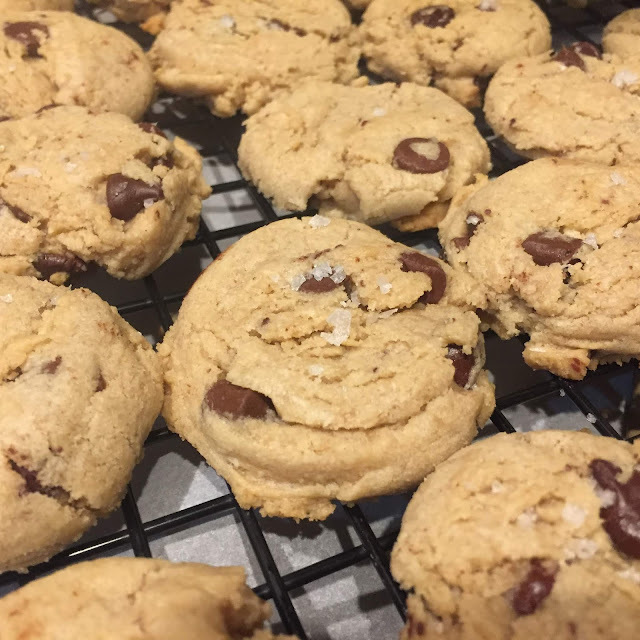 These chocolate chip cookies are made with almond flour, so they have an added nutty flavor. The almond flour also makes the cookies a little chewier but they have a sandier texture that reminded me a little of shortbread. They end up very consistent in shape since they get flattened halfway through the baking process. If you can wait, make the cookie dough a day ahead, and then bake the following day or second day. As crazy as it sounds, I swear the flavors marinate more in the fridge and result in an even yummier cookie. By the way, you could substitute the chocolate for chocolate chips or M&M’s. For a Christmas cookie, you could even throw in the red and green M&M’s. I sprinkled some fleur de sel on prior to baking because the salt just brings out the flavor even more! Preheat oven to 350° and line two baking sheets with parchment paper, and set aside. Combine both flours, salt, baking soda, and baking powder in a bowl and set aside. Mix butter, both sugars, and vanilla in the bowl of a stand mixer with a paddle attachment on medium-high speed until smooth and fluffy, about 3 minutes. Add yolks, one at a time, beating after each addition. Next, add dry ingredients; beat on low speed until just combined. Add chocolate and mix until combined. Roll dough into 1 1⁄2tbsp. sized balls and place on baking sheet about 2” apart. Bake for 8 minutes. Using a metal spatula, gently press cookie down slightly. Bake 7 minutes more and cool slightly before serving.